This book was a recommended read from Ilona Andrews, whose opinion I trust, and the blurb somehow reminded me of Ann Aguirre’s Sirantha Jax, when it comes to space piloting, which I found fascinating. I read the first chapter excerpt and couldn’t wait to get it, so it actually jumped the line over several things that should have been first. I was also pretty pleased that it breaks my cycle of eyes in science fiction (while those have overall been successful for me-it would be tedious if that was only how I found science fiction books), and that it was a male protagonist with no reported romance interest, like The Martian, which was a highly successful read for me. So my goal for this was as an entertaining palate cleanser. 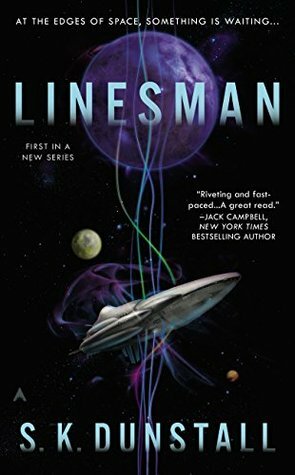 This is definitively science fiction, but I think it would be accessible to even non-science fiction readers, because the science isn’t heavy (though there are sentient ships which is always a cool feature), plus there is plenty of action and adventure, and interesting character studies. I truly liked most of the characters, i wanted to see them prevail, I wanted the ships to be heard, it is a story where there is always someone to root for. And while the linesmen aren’t the pilots, it was very satsifying for the technicians to be the heroes of the story, not the more glory filled professions. Like I said, I really enjoyed this story and I couldn’t be happier that it looks like a sequel is in the works, since this is a world I’d like to spend more time in and see how future developments unfold. I like romance in books, although I can enjoy a book without romance as well. I like it when in fantasy of sci-fi books the politics are done well, politics sure can be interesting. I like the sound of sentient ships! Great review! Thanks! Mostly I tend to prefer romance, even in science fiction, for a good romance in sci-fi, check out Michelle Diener’s Dark Horse. But every now and again it’s good to get out of my usual tastes and see what’s out there. I also found it via Ilona Andrews. There was a reverse trope in this tale; instead of an ordinary girl finding she has extraordinary powers, it was a youngish man. He had come out of the slums, received an education and now, almost by chance, was at the very hub of things. His awakening abilities cost him pain and some more humiliation, but his new friends stuck by him and he didn’t lose his nice nature. The sc-fi magic was given a musical flavour that made it easier for a lay person like me to adjust. It’s clear that powerful people now want to get hold of him to further their own world(s) wide politics. I look forward to reading more about Ean.